Dr. Brouillet earned his medical degree and completed his orthopedic surgery residency at the University of Maryland in Baltimore. Dr. Brouillet is the Chief of Surgery and Director of the Joint Replacement Center at Kernan Hospital. He is a member of the National Football League Injury Grievance Panel, Inter-Scholastic Athletic Advisory Committee for the Howard County High Schools, and Medical Advisory Board for the Columbia Association. Dr. Brouillet serves as a team physician for Centennial High School. He is the past team physician for the Baltimore Blast professional soccer team and past president of the Maryland Orthopedic Association. 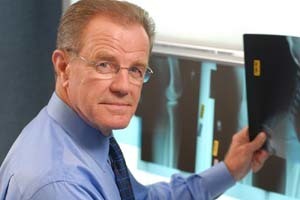 Dr. Brouillet is a fellow of the American Academy of Orthopedic Surgery and a member of the American Orthopedic Society for Sports Medicine, American Academy of Orthopaedic Surgeons, American Medical Association, Maryland Orthopedic Association, Baltimore City Medical Society, Maryland Orthopedic Society, and Eastern Orthopedic Association.